The Lava phone is just a tad faster than the FFRD we tested at the beginning of the year, which may not sound like much but is positive given that Mike Bell was very confident that all Intel FFRD phones would deliver the same level of performance. 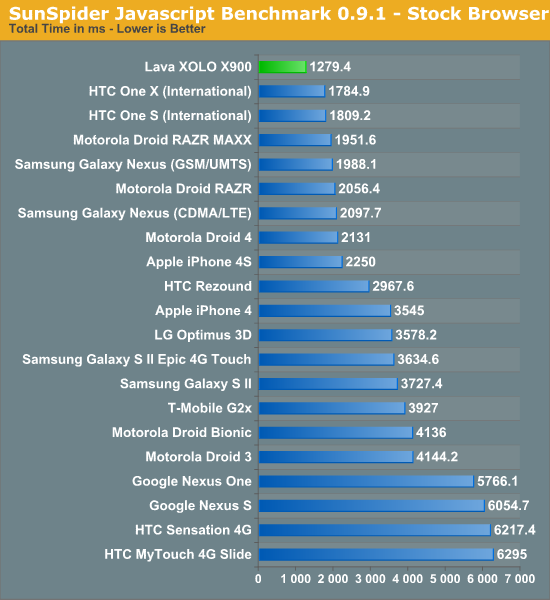 The X900 ends up being the fastest smartphone we've ever tested here. Intel won't be able to claim that title in any other benchmark here today but it's an impressive feat for just now showing up to the game. 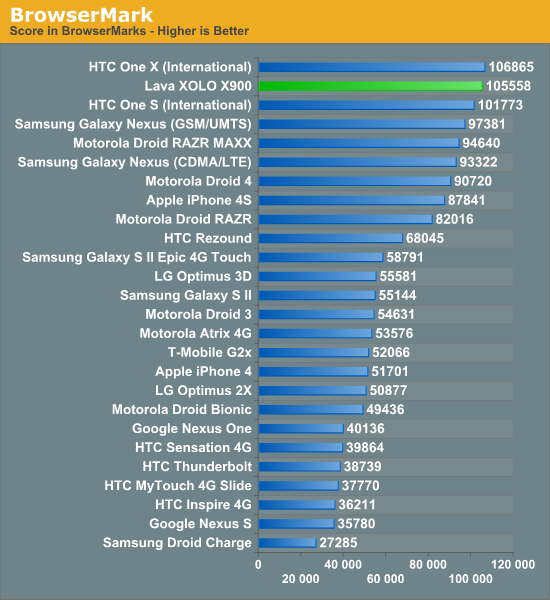 It's also worth pointing out that Intel is able to do this well running on Gingerbread, while its closest competition are running on Ice Cream Sandwich with far improved JS performance built into the browser. Why is Medfield so much faster here? It's tough to say, but likely a combination of reasons. Google's V8 engine has had a ton of optimization work done around x86 to begin with. By virtue of nearly every computing platform that runs a Google browser outside of Android being x86, it's natural that some of those optimizations are going to transition over into Android for x86 as well. That's actually a part of a much larger advantage Intel has should x86 take off in the smartphone space. On a more technical hardware level, Intel claims its cache and memory interfaces are simply better than the competition here - which in turn results in a significant performance jump in Sunspider. 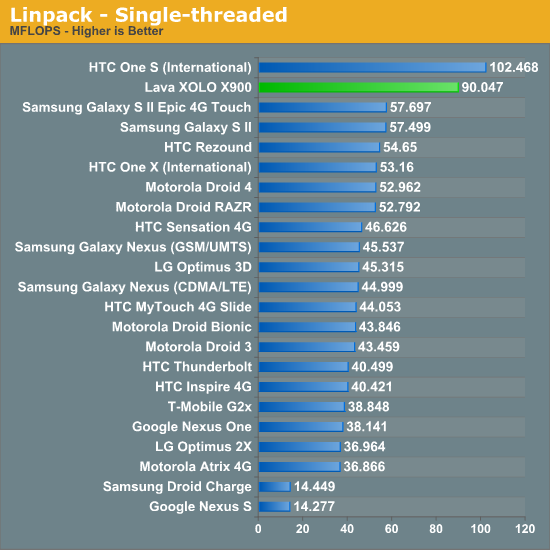 For a single Atom core running Gingerbread, Medfield does very well here - roughly equaling the performance of NVIDIA's Tegra 3 (HTC One X) and Qualcomm's Snapdragon S4 (HTC One S). It's quite possible that when running ICS Medfield will once again step ahead of the competition, but even if this is as good as it gets it's a good start. Keep in mind that we're looking at a 4 year old microprocessor architecture running on a n - 1 process from Intel. 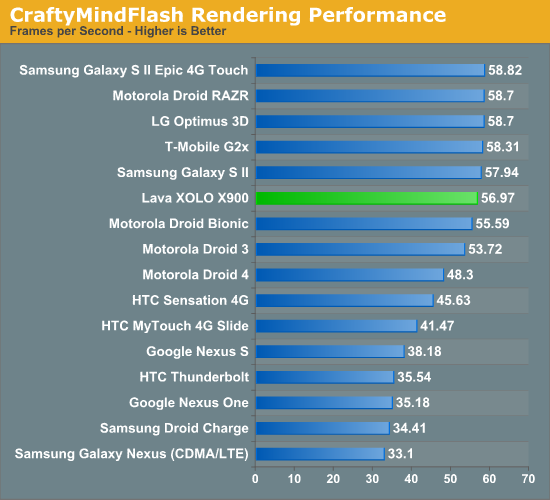 Single threaded FP performance is very good on Medfield as you'd expect, but a bit lower than Qualcomm's Snapdragon S4. As Krait is a wider, out-of-order architecture with a fairly reasonable FPU the 13% advantage here isn't too surprising. Compared to anything A9 based however, Medfield is obviously quicker. There's roughly no change in Medfield's performance here, which will be an issue for any compute heavy, very threaded application. Luckily for Intel, not many of these types of applications exist on smartphones today, but it is a limitation of this first generation Medfield. Hyper Threading is a great way to increase CPU utilization power efficiently, but for some workloads there's no replacement for more cores. 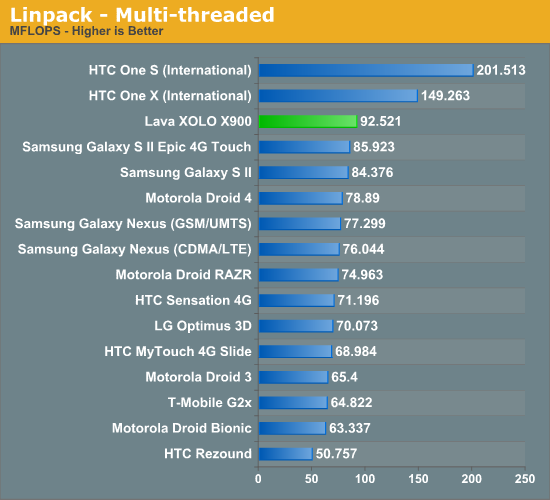 Snapdragon S4 does extremely well here in the HTC One S by being a combination of two cores and having a much faster FPU. 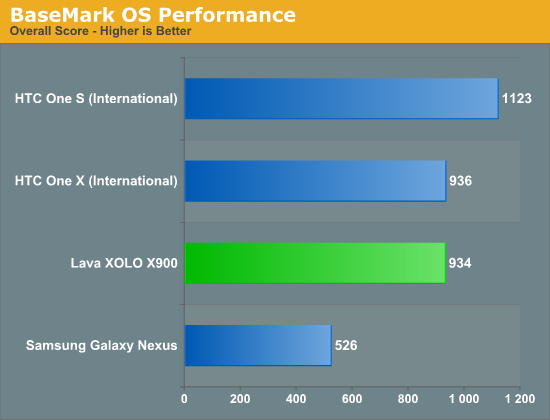 At least in BaseMark OS, Intel's performance is distinctly modern although not at the head of the class. Differences in performance here extend beyond the SoC and are obviously influenced by things like NAND selection as well as the OS on the device. 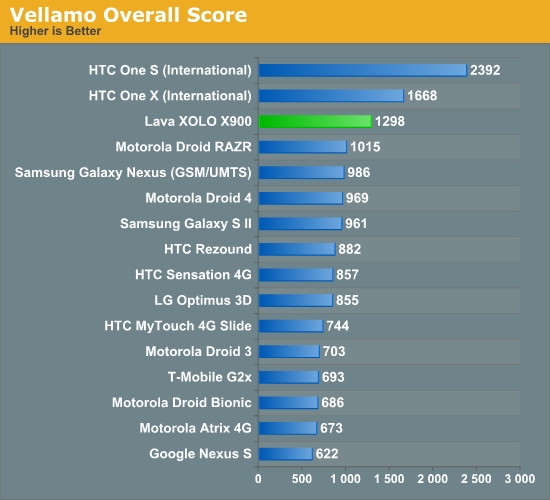 For many of these benchmarks I'm very curious to see how they change with the arrival of Ice Cream Sandwich. Once again we have a good showing from Intel. The X900 and its Medfield soul aren't the fastest, but Intel's first smartphone is in the top three and faster than almost everything that came before it. Much of the advantage here actually comes from the Google V8 benchmark, another js test, which we've already established Intel can do quite well in.